Hanamikoji is the first game from the EmperorS4 Games publishing house in my collection. Christopher told me the designer's (Kota Nakayama) artwork was beautiful and so when he brought the game home for us to play, I was looking forward to the unboxing and reveal. As he opened the box and laid out the cards, I saw he was correct - the cards are absolutely perfect. He thought I'd do well at the game since I generally ace most games of Battle Line that we play and he felt the basic elements were somewhat similar. In both games there is a race to capture object cards based on a bit of calculated projections and a fair bit of guesswork. 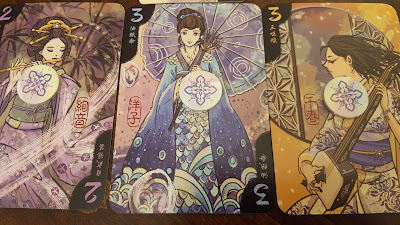 In this case, the object cards are the lovely Geisha cards, numbered 2 through 5. Each card numbered 2 comes with two corresponding standard size cards with coordinating artwork, each card numbered 3 comes with three cards, and so on. The mechanics of this area control game are deceptively simple - each player is dealt a starting hand of six cards and then you draw a card on your turn from the deck (one card is removed at the beginning of the game and set aside to increase the unknown variables) and then play one of four actions. You can exclude 2 cards from your hand from the game, save 1 card from your hand to reveal and play at the end of the game, choose 3 cards from your hand and offer them up to your opponent to immediately choose 1 to play on their side while you immediately play the remaining 2, or you can choose 4 cards from your hand and divide them into pairs and offer up the pairs to your opponent to immediately choose 1 pair to play on their side while you immediately play the remaining pair. That's it. Four actions, each done only one time by each player and then the game is over. A Geisha card is won by a simple majority of her corresponding standard cards laid on the winning player's side of the Geisha. When she is won, a round marker that has been resting on the center of her card is moved toward the edge of the card on the winning player's side. 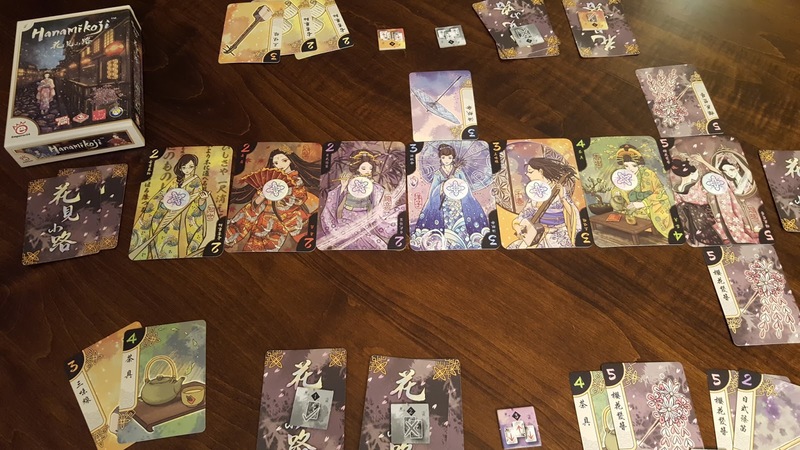 To win the game, a player must win four Geishas (out of seven) or score 11 points among the Geishas they have won (Geishas are worth their numerical value). If the game ends without anyone crossing these thresholds, the game is played again, but this time the round win markers are left in place from the last game and if a player wins a Geisha that was won the previous round by the opponent then the win marker is moved to the winning player's edge of the card as expected, but if the players tie for a Geisha it remains on the previous winner's edge. While the mechanics are easy to explain, making quick and exacting decisions based on very limited information in order to pull off a win is anything but easy. 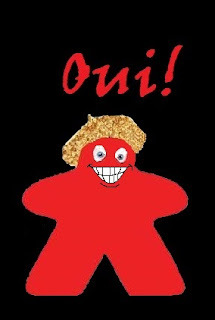 Christopher noted that the only card from your hand that you can choose to definitively play is the one you hide for reveal and play at the end of the game. All other actions provide your opponent the chance to select the cards to play for both of you, injecting additional uncontrolled variables into the game and mucking up the direct follow through of what you might have willed. You can attempt to disrupt their selection by offering up cards you think will tempt them to make choices you prefer and by using the 2 throwaway cards to dismiss cards that might swing the game in their favor, but otherwise you are helpless. It took me three consecutive games before I was able to formulate a winning strategy in the face of all the unknown variables. The first two games though? Trying to outsmart Christopher with such limited information available over a small set of choices gave me the kind of headache that only balancing chemistry equations did in college. I have a gift for divergent thinking and for anyone who approaches tasks similarly, games that focus on expanding options and creative moves bring out the best in us while games such as these that focus on narrowing down options based on a static set of known or unknown variables is a challenge. Still, it's good to be challenged intellectually, even if it is a bit frustrating at times. The components for Hanamikoji are compact and travel easily in the 4 1/2 by 6 1/2 inch box they come in. All of these pieces are either sturdy cardboard cutouts or glossy paper cards which should hold up well to long term use (though not puppy or small child bent on destruction safe as I always like to note when applicable) The components carry the theme well. Although this game is never going to be a favorite in my collection, the stunning artwork will lead me to bring it out every now and then when I want to sharpen my convergent thinking skills (it's a logic puzzle at heart).